Ok, I know this isn’t the most beautiful picture in the world but it’s a real one. I love football season. I don’t say that because I like to kick back and scream/cheer at the television, or monitor the spreads (can’t figure them out anyway), or follow a fantasy team. I love it because it means time in the kitchen, pumping out food for a crowd that has gathered in our family room and spending time with them. I guess you could say that over time, our house has evolved into the football open house. Of course, if you are a fan from the opposing team you might not be welcomed that weekend. But I digress. We could have a crowd of 6 guys one Sunday, close family the next week or it could be a gathering of 3 families with kids running around. I like that variety. It has probably helped me branch out and try new meals, catering to the new group I have in my house that day. I love the fact that it is an all day event, with people coming and going, and I can easily plan my food prep and still visit with people. I like to think I have the Sunday tradition down to a science, where some appetizers are made for the one o’clock game and the main dish gets served during half-time of the four o’clock game. Maybe it’s strange to enjoy spending the day in the kitchen, but I like it. Usually, I will make something I am comfortable with that are fan favorites, and then change it up and try a new side dish or appetizer. If it fails – bring out the chips. I even got giddy one weekend recently (not a term used to describe me), because we found out our kid’s soccer game was cancelled, so that meant more “me” time in the kitchen. I know, I have issues. In a large mixing bowl, combine the Worcestershire sauce, ketchup, cider vinegar, soy and maple syrup and stir to combine. Chop up desired amount of chipotle peppers and add to mixture. Let stand until needed. Preheat oven to 300. Take the rack of ribs and cut them in half. Season with salt and pepper. Add flour to one of the foil pans. Add the ribs and dredge both sides of each section so fully coated. Place a large roasting pan on the stove on high heat (could cover two burners), and add canola oil. When the oil is hot, shake off the excess flour and place ribs (I did three at a time) in the pan, and sear on one side. After nice brown sear has developed, you can then flip them. It will take about 4 to 5 minutes per side. 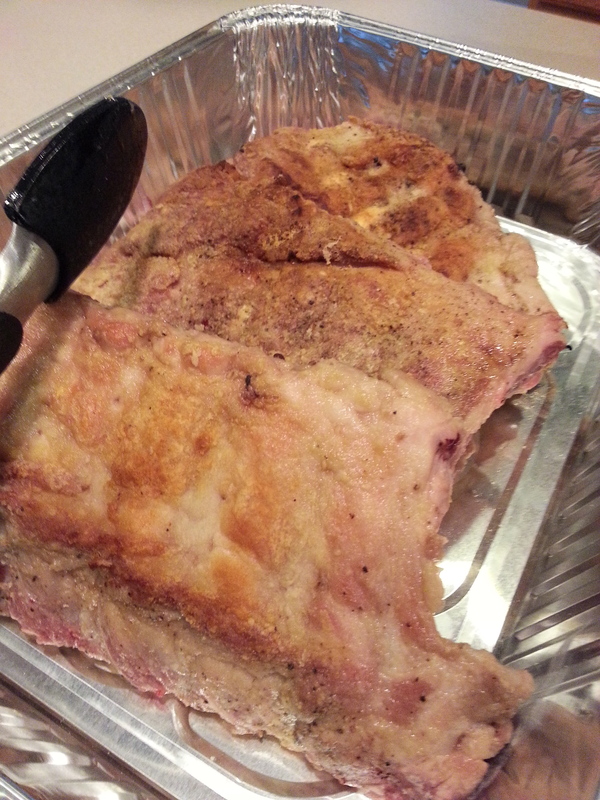 Remove ribs from heat and place in the other foil pan to rest while finishing the remaining ribs. 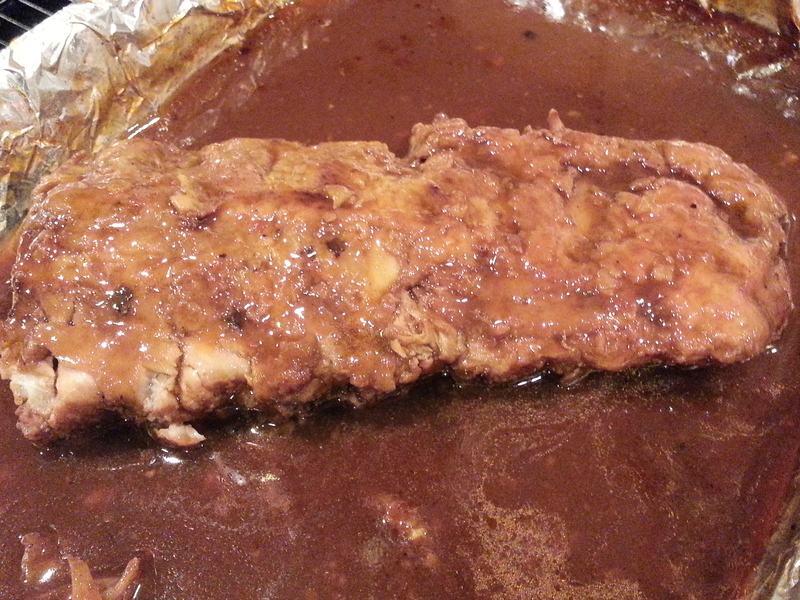 Once ribs are done, drain the excess oil from the pan, but leave any meaty bits that remain in the pan. 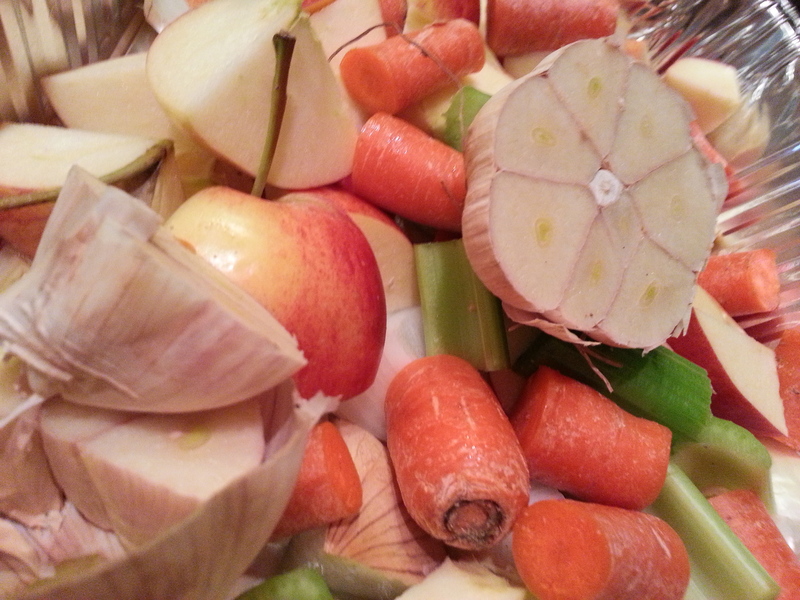 While the ribs are browning, cut all the vegetables into nice thick chunks. 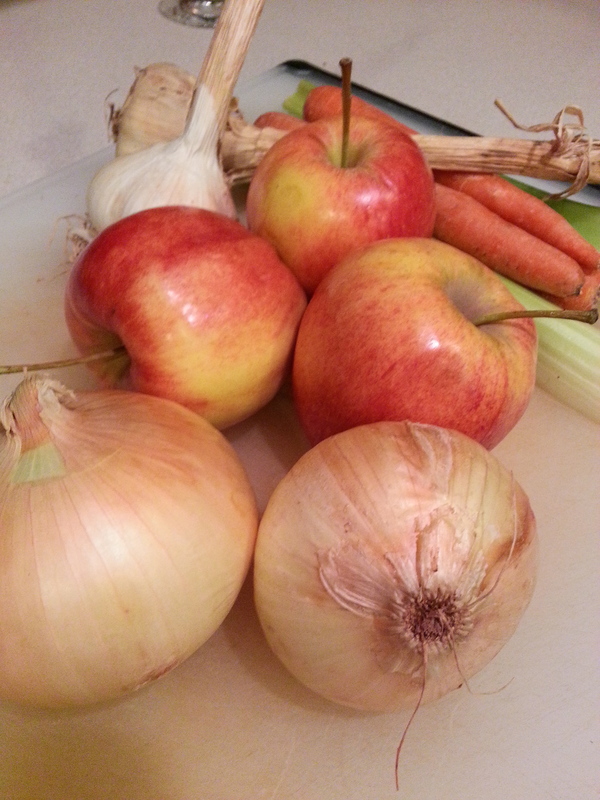 Halve the garlic and quarter the apples. Do not remove the skins on anything because all will be strained later. 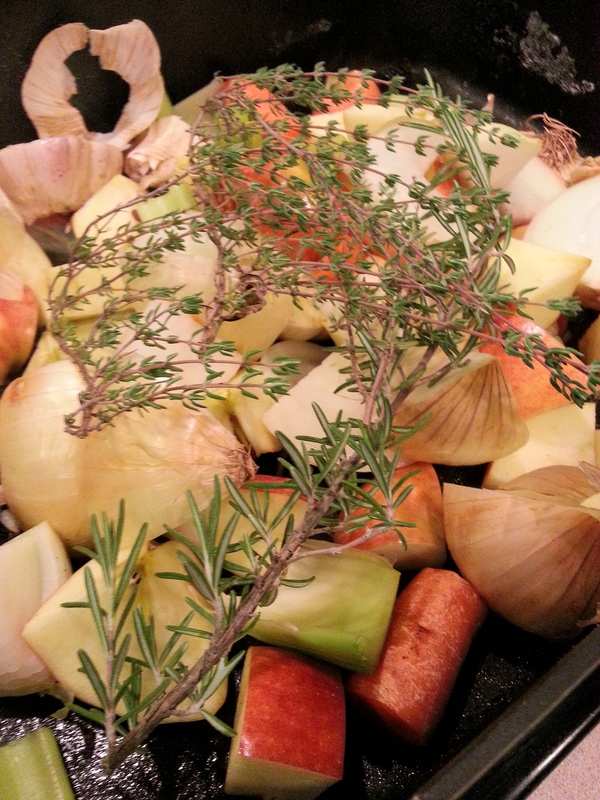 Add all the vegetables, apples and the herbs in to the roasting pan. Keep the heat up to caramelize them. After a few minutes, toss them and let them sit a few minutes longer. 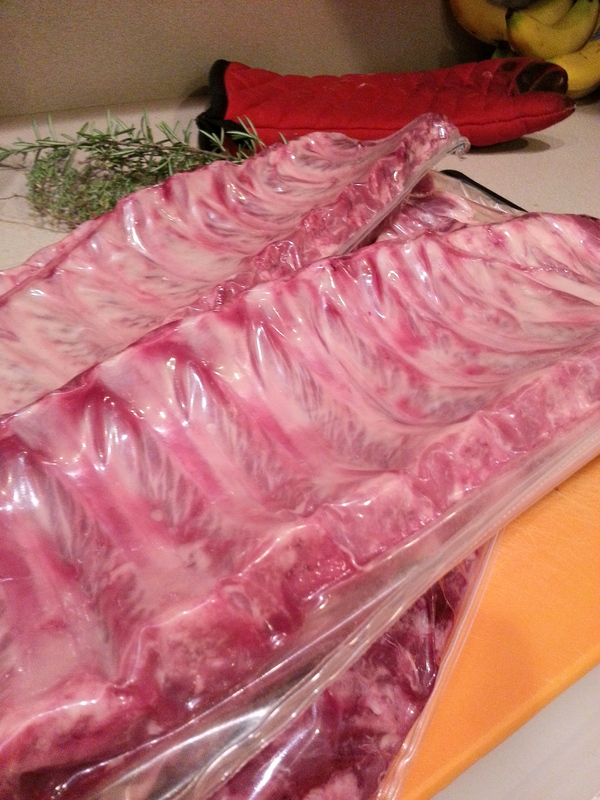 Return the ribs to the pan (you may have to slightly layer them to get them to fit). Add the liquids to the cooking pan. 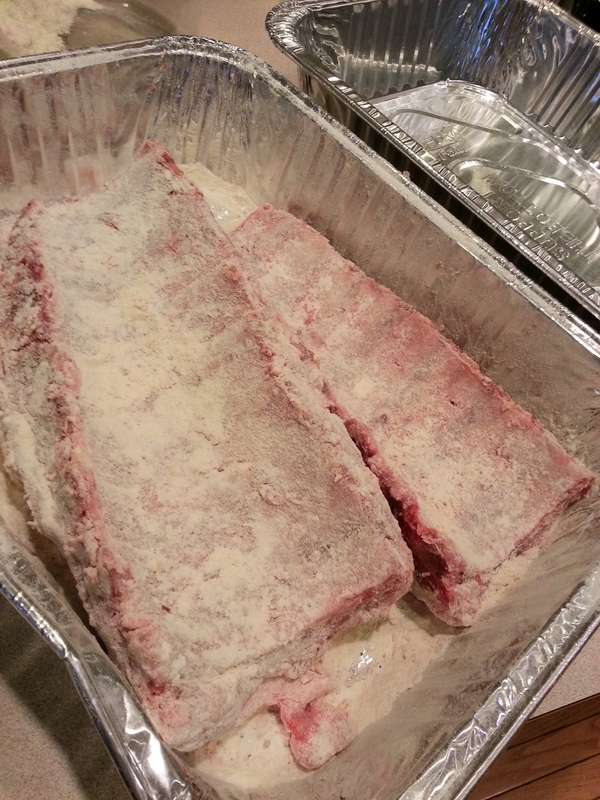 Add the wine and then add enough water, if needed, to ensure the ribs are just barely covered. Bring the mixture to a boil. 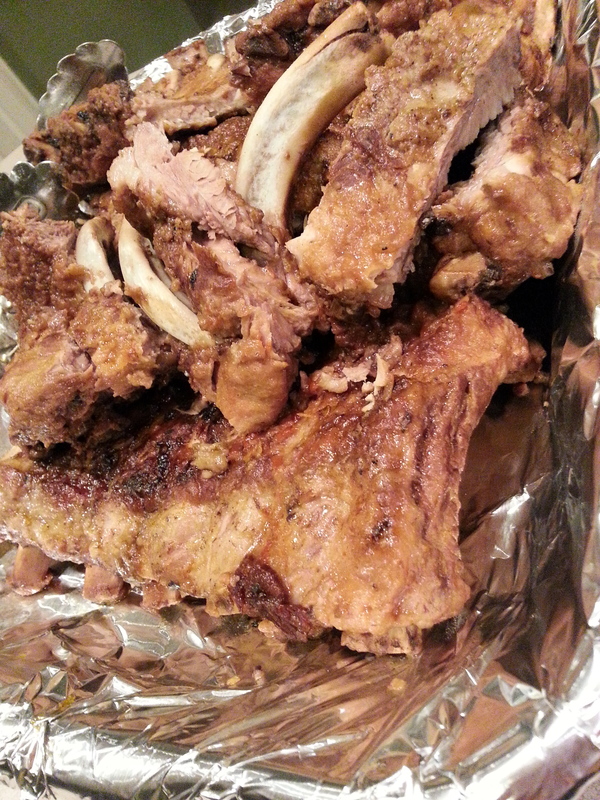 Turn stove off and cover the pan with foil and place them in the oven until the ribs are barely fork tender – about 1 1/2 hours. 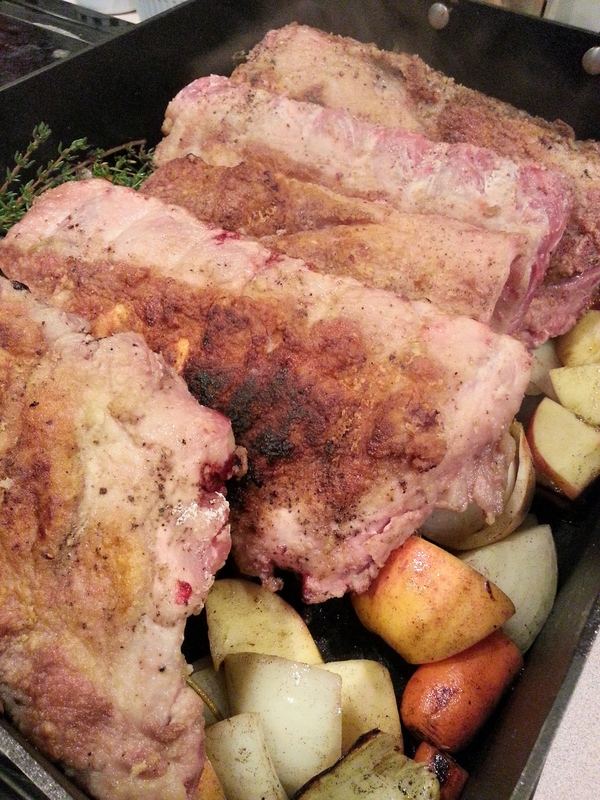 Remove the meat from the pot and cut into rib sections and set aside. Strain the solids out of the liquid and return the liquid to the pan and reduce by half (about 15 minutes) to make the barbecue glaze. When nearly done, remove about a 1/2 cup of liquid and place in a small liquid measuring cup. Add the potato or corn starch and whisk until smooth. Add the starch mixture back into the reduced glaze. This will help thicken the glaze. 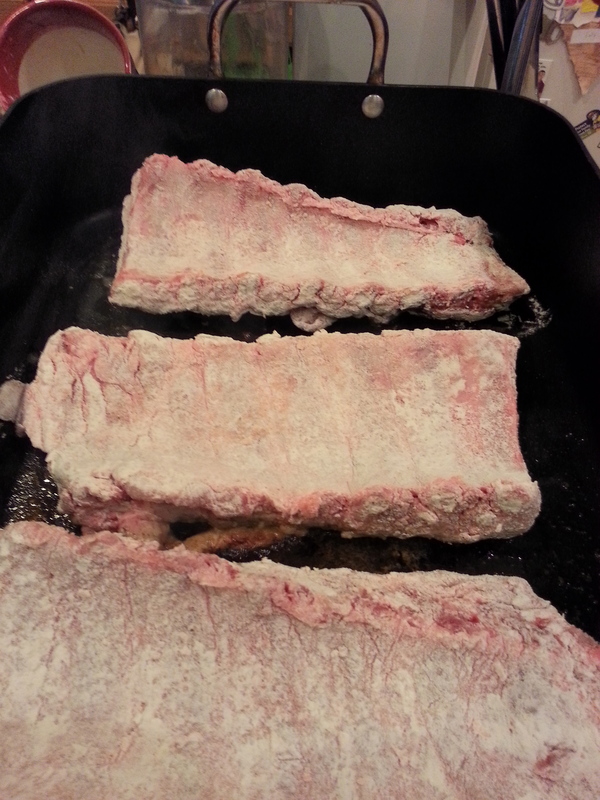 Toss the ribs back into the glaze to warm and coat them. Mound the ribs on a platter (or in the pan and let the guests help themselves) and serve! This recipe serves four people. I noted earlier that after straining the liquid I had a lot to reduce. I think next time I will take half the liquid and then start to reduce. I should have a nice glaze next time rather than waiting 30 minutes! Still tasted great and the ribs were super tender. 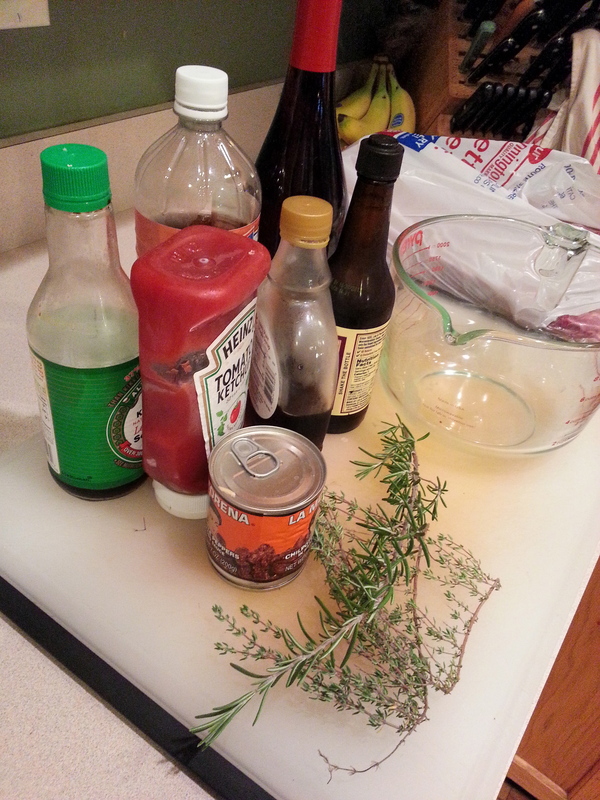 This entry was posted in pork and tagged aromatics, barbecue, glaze, meat, pork, ribs. Bookmark the permalink.